These days, there’s never a shortage of Filipino Dinner Pop-up in Los Angeles at least that what I’ve noticed. Whenever I see an Instagram feed or get an email announcement of a Filipino dinner pop-up, I grab those tickets before they’re sold out. It seems to be the thing to do to find innovative Filipino food in Southern California. While the Filipino Food Movement is coming around in SoCal (with the exposure of local Filipino Chefs and social media groupies and the food-related publications and websites); it’s a steady momentum in a major city like NYC and San Francisco. Speaking of San Francisco, the city of Oakland is on the other side of the bridge and it’s home to the Lumpia Chef Lumpia Chef Alex Rotodo and The Lumpia Company. 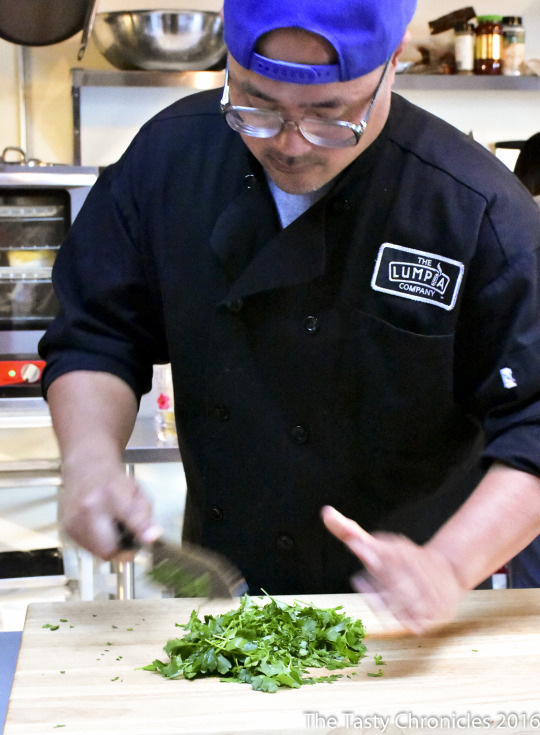 The Lumpia Company owner is a purveyor of handcrafted, gourmet Lumpia. 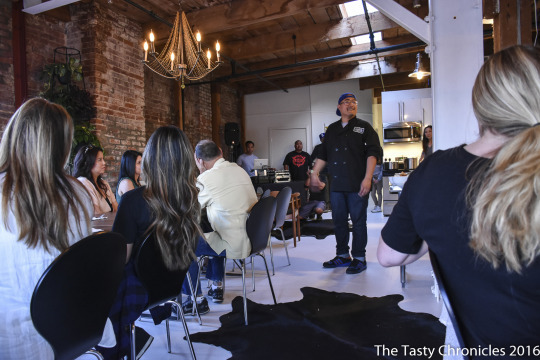 Last month via the Feastly (a website that connects chefs and diners at the dinner table), Retodo had his very first Filipino Pop-up at the Downtown LA Arts District. Lumpia is the pride and joy delicacy of Filipinos. How French Fries are to Americans, Lumpias are the favorite side dish for Filipinos. While there are many varieties of Lumpia; it’s the Lumpia Shanghai that gives us the greatest joy. 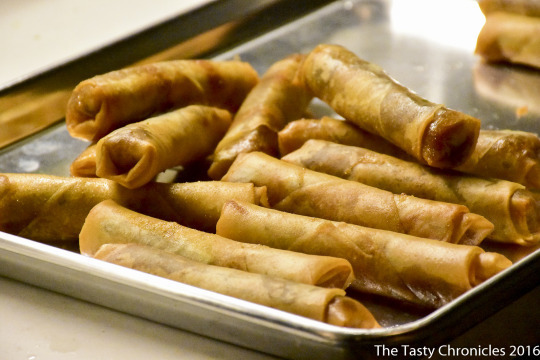 Lumpia Shanghai is Filipino-version of the Chinese Spring Roll. What makes them so unique is the Lumpia Wrapper; a delicate paper thin crepe when fried, transforms itself into a crispy exoskeleton to whatever is stuffed inside. The traditional version of Lumpia is made of seasoned ground meat (with a little bit of garlic and vinegar). It’s rolled up with the wrapper as thinly as possible and fried to a golden crisp. 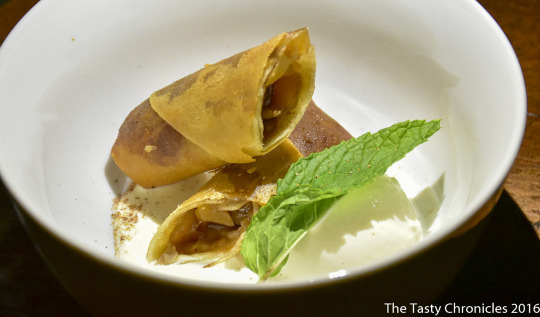 Chef Alex Rotodo’s handcrafted Lumpia are quite different than the traditional version. What The Lumpia Company offers are a more gourmet version with fillings that are of un-typical Filipino ingredients. It’s also much larger. 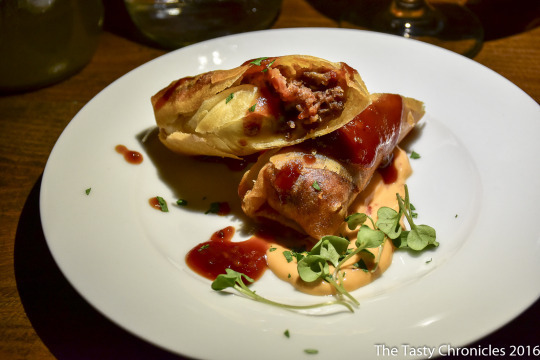 The themed Lumpia Bar Americana pop-up menu included three of The Lumpia Company’s most popular Lumpia plus an inventive Filipino-style Pot Pie. Details of the entire menu can be found by clicking here. I admit that it was a very jovial evening of celebrating (and eating) the Lumpia. The first entree, the Napa Valley-Inspired Lumpia, is a delicious one. If I had a wine party and needed an elegant hor d’oeuvre, it would be this one. 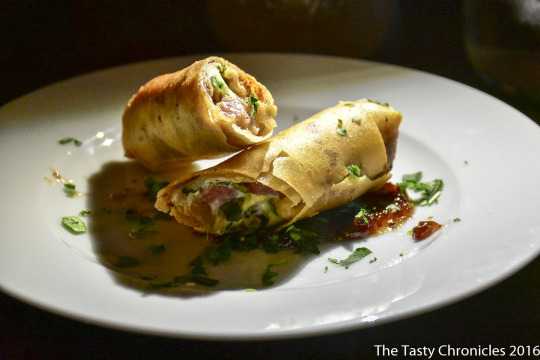 The lumpia is rolled with Aged Italian Salami, asiago cheese,and arugula. Then it’s deep fried to a golden crisp. The sauce that accompanied it was a delightful Pickled Mission Fig Jam. The Bacon Cheeseburger Lumpia was just like like eating a hamburger. It’s the homemade barbecue sauce that needs to be bottled and sold along side it. 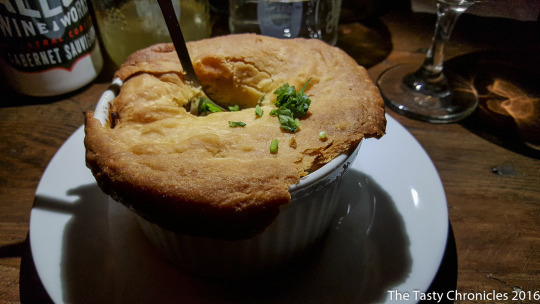 The Chicken Afritada Pot Pie was another entree as unique as the gourmet Lumpia. Chicken Afritada is basically a Filipino version of Chicken Stew. Chef Retodo “Americanized” it into a Chicken Pot Pie. Dessert ended with the Apple Pie Lumpia with Ice Cream. I really like this take on the good old Apple Pie. It, too, would be a perfect appetizer with a glass of champagne Moscato. It was pretty cool to come across Chef Alex Rotodo and his The Lumpia Company’s Filipino Dinner Pop-up in Los Angeles. His version of the Lumpia was tasty and the whole dining experience was genuinely fun. 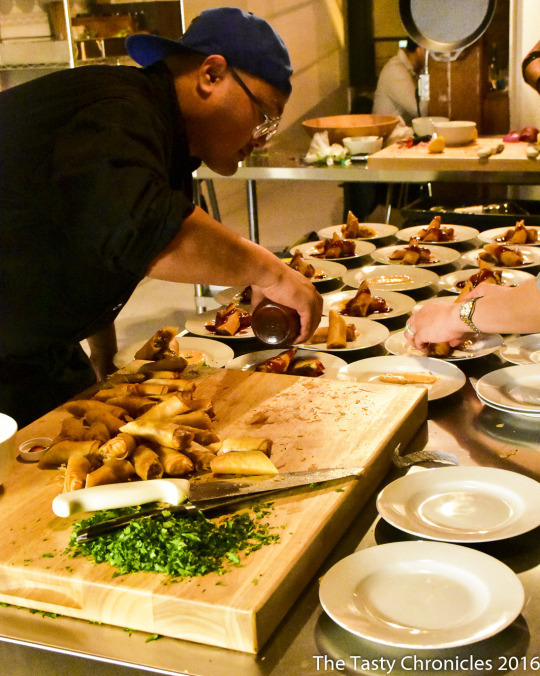 Filipino chefs like Chef Alex Rotodo and dining hosts like Feastly create a more intimate dining experience that one would never experience in a restaurant. Would I do this again? Absolutely.